Getting in on the building boom on Upper East Side in the first years after the Civil War was Dr. William S. Wood. He purchased three narrow building plots on East 71st Street—Nos. 168 through 172—between Lexington and Third Avenues and hired architect Frank S. Dwight to design respectable middle-class homes. Within the next decade the surrounding streets would see scores of speculative Italianate brownstones erected; all essentially cut from the same cloth. Dwight, however, stepped out of that box. Starting with the overall Italianate model, he outlined each home with quoins and floated carved lintels over the elliptical-arched openings of the second and third floors. The skinny doorways were framed by paneled pilasters and surrounded by stone carved to resemble blocks. The highly-unusual entrances were much sterner and geometric, despite the foliate brackets, than the more common Italianate doorways in the neighborhood. No,. 172 survives among the row with most of its original details. The homes attracted financially-secure, respectable families. As the turn of the century approached, the block was becoming noticeably higher-end as mansions arose along Fifth and Madison Avenues and the fashionable neighborhood spread eastward. When Mary F. Goodwin sold No. 168 to “Mrs. Hawkins,” the wife of Eugene T. Hawkins, in 1897, former Park Commissioner Abraham B. Tappen was living at No. 170 and architect William Alciphon Boring was living at No. 172. A retired lawyer, Tappen and his family were humiliated on April 6, 1895 when he was arrested and charged with bribery and conspiracy, along with seven other commissioners and former commissioners. To satisfy his $30,000 bond he gave his house as security. The figure would amount to over $800,000 today. The Tappen family would soon leave No. 170. On May 4, 1902 an advertisement in the New-York Tribune offered “handsomely furnished rooms, reasonable.” At some point next door neighbor William Boring purchased the house; perhaps to protect his own property. In the meantime No. 168 had changed hands a few times. Hawkins sold it in 1902 to P. J. Cuksley, who sold it to Charles S. Faulkner who sold it in 1906 to Austin W. Lord. But that was all about to change. On November 5, 1910 the New-York Tribune reported that William A. Boring sold the house at No. 170 East 71st Street. The buyer was Dr. Adrian Van Sinderen Lambert who simultaneously purchased No. 168. At the time wealthy New Yorkers were buying up the old brownstones in the area and converting them to upscale mansions. Lambert had the same idea. A month before the sale of No. 170 was completed; the Real Estate Record and Builders’ Guide reported “La Farge & Morris, architects…are still taking bids for alterations to the residence of Dr. Adrian Van S. Lambert.” Unlike other makeovers that resulted in neo-Federal or Georgian homes, Lambert’s would be less architecturally-dramatic. He instructed the architects to simply combine the brownstones into a single, expansive mansion. Dr. Lambert's completed mansion looked, frankly, like two separate, renovated brownstones. Within the year the conversion was complete. The stoops had been removed and the doorways—a main entrance and a service door—were moved to slightly below sidewalk level. The original parlor floor doorways were altered as windows and framed in carved stone to match the existing openings. Otherwise, the exterior retained its 1867 features. Lambert was a highly-respected surgeon, having been educated at Yale and Columbia Universities. He was, by now, Associate Professor of Surgery at Columbia and was Visiting Surgeon to the Presbyterian Hospital. Dr. Lambert’s expertise would be called upon on July 18, 1917. Mrs. Arthur Woods was no ordinary patient. She was not only the wife of a Police Commissioner (they had married just one year earlier); she was daughter of William Pierson Hamilton (great-grandson of Alexander Hamilton) and Juliet Pierpont Morgan (daughter of J. P. Morgan). Earlier in the week she left her summer estate for a visit with at her parents’ home at No. 32 East 36th Street. Shortly before midnight on the 18th she complained of feeling ill and Adrian Lambert was summoned. Lambert recognized the problem—appendicitis—and, as reported in The Sun, “He advised an immediate operation.” The doctor operated on the young socialite in the Hamilton mansion in the dead of the night. In the morning The Sun reported “The operation was entirely successful and Mrs. Woods is reported to be recovering nicely.” It was the sort of acclaim that provided Adrian Lambert with the means to afford a wide mansion in one of Manhattan’s most fashionable neighborhoods. The Lamberts would stay on in the house for decades. On November 29, 1938 it was the scene of an impressive wedding. The Lamberts' niece, Elizabeth Miller Mitchell, was the widow of Brigadier General William L. “Billy” Mitchell; who earned the nickname “the father of the U. S. Air Force” and had died two years earlier. The groom was Thomas Byrd of Winchester, Virginia; a descendant of one of the "First Families of Virginia." His brothers, who served as his two best men, possibly stole the spotlight from the couple that day. One was United States Senator Harry Flood Byrd; a powerful figure in Virginia politics, newspaper publisher and land owner. The second was Rear Admiral Richard Evelyn Byrd, Jr., who earned his fame less through his naval service than through his polar expeditions. Within two years Dr. and Mrs. Lambert moved on and No. 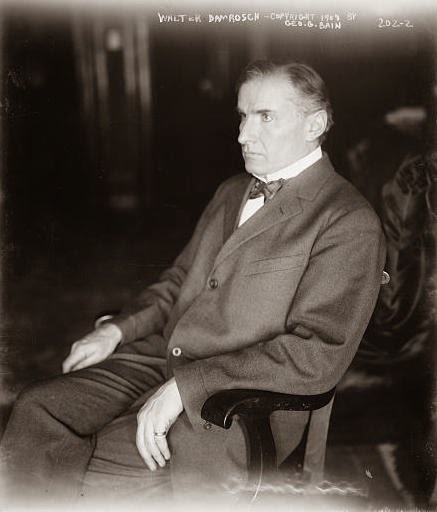 168 became home to famed conductor Walter Damrosch and his wife, Margaret. Mrs. Damrosch was the daughter of James G. Blaine, Secretary of State under Presidents Garfield and Arthur. It was, of course, Walter Damrosch who garnered the attention. Called the “Dean of American Conductors,” he was a composer, conductor and pianist. He began conducting at the Metropolitan Opera House in 1885 and later became conductor of the New York Symphony Orchestra. He formed the Damrosch Opera Company to stage Wagner compositions in 1895 and composed four operas. Among the first entertainments in the house was a double ceremony on May 18, 1940 to celebrate Walter’s and Margaret’s 50th anniversary and to introduce their granddaughter, Margot Damrosch Finletter to society. The afternoon reception was a socially-important one and all four of the Damrosch daughters were there to help in the receiving line. The aging Walter and Margaret Damrosch divided their time between East 71st Street and their summer home in Bar Harbor, Maine. On his 80th birthday in 1942, the conductor was feted with a reception by the Directors of the Metropolitan Opera Guild and a dinner by the American Academy of Arts and Letters, of which he was President. In his will he provided $5,000 to Felicia Geffen, the secretary to both him and Margaret; and $1,000 each to Mary O’Donnell, their waitress; Germaine Marie, the cook; and their maid Elisha Pinski. The four daughters received the bulk of the estate. Daughter Anita and her husband Robert Littell moved into No. 168 East 71st Street and were still here when their third grandchild was born. An additional floor was added before the end of the 20th century and the brownstone façade has been painted; but otherwise the combined houses are little changed since the 1910 renovation. In 1924 my mother´s uncle Anders Tage Eugen Erikson/Eriksen emigrated from Norway to New York. (He was Swedish.) His destination was 168 E, 71 st Street in New York and his aunt Mrs Hanne Davis. Were the staff resident in the house? Is there any possibility to receive more information about Anders Tage Eugen (Andrew? ), a weaver by occupation, or Hanne from you or your sources? I will be very grateful for any information that leads to the continuing life adventures of my relatives who lost contact with the Swedish/Norwegian side of the family before WWII. I really enjoy seeing pictures of the house with the information that it has not changed since my relatives lived there in the 1920-ies. Thank you! I can find no mention of your relatives, unfortunately. They may or may not have lived in the house. Certain of the domestic staff lived with the family; while others came and went like others going to work. Thank you for looking it up! I wished you would find them there, but at least now I know where not to keep looking. I will follow this up later and if I find anything I think would be of interest to your research of the house, I will get back to you. The 1853 Springsteen House No. 130 Charles St.